Over at Julie's: What's All the Buzz About? I've been hanging out in my garden fascinated by some bok choy that is past it's prime. What you ask is my fascination? 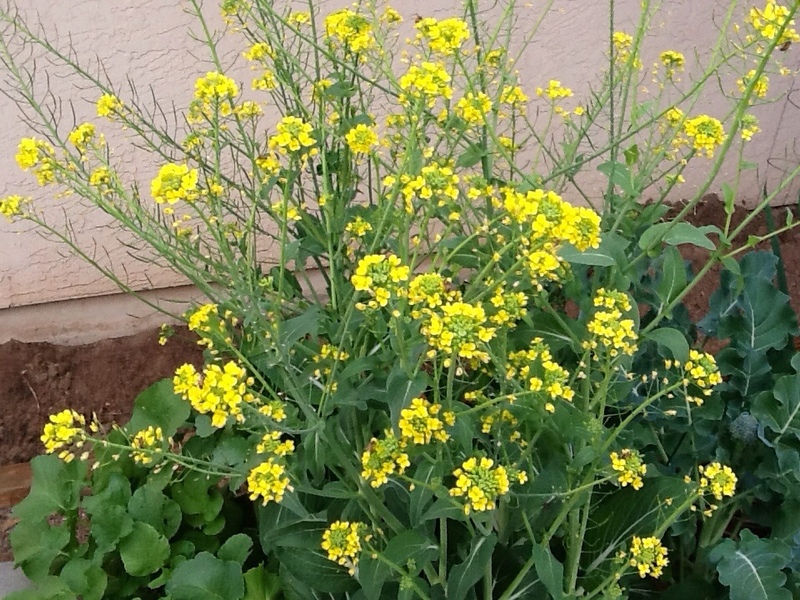 Well, the bok choy is flowering and the yellow flowers have attracted some visitors . . . Honey Bees! I am simply buzzing with excitement over this great find! You see, I am crazy about Honey Bees! The more I hang out with them, the more interested in Honey Bees I become. I'm even dreaming about them when I go to sleep! Honey Bees, raw honey, it's amazing taste, and all its healing properties have led me in my quest to becoming an Apiarist! My enthusiasm has rubbed off on Will and together we are researching the art of beekeeping. Our first BACA meeting is scheduled for the third Thursday of this month! That's the Beekeeping Association of Central Arizona. We are hoping to be mentored by experienced beekeepers, find some local bee and beekeeping suppliers and make new friends. New members are called New-bees. Cute, huh? Vanishing of the Bees was very Last year I purchased heirloom seeds. These seeds are able to reproduce after their own kind. When buying seeds look for the word "heirloom" on the front of the package. When produce is near the end of production don't pull out all your plants. Leave a couple healthy plants and allow them to go through their whole life cycle. For instance, my bok choy has started to blossom so I am letting two healthy plants blossom, receive pollination from bees, and form mature seedpods. I will harvest the stems with all the seedpods attached. I save hangers with a clip on each end, the ones used for slacks and skirts. I use the clips to hold the stems, place the stems in a lunch sack and clip the sack to catch the seeds as the seedpods open. I use these same hangers to dry my herbs. My laundry room is ideal for drying seedpods and herbs because it is a dark and dry place. But I digress.informative. It shared that 1 out of every 3 bites of food we take, honeybees make possible. There has been a serious collapse of thousands of hives in the US thought to be caused by new systemic poisons incorporated within the seed nonorganic farmers are planting. Honeybees are responsible for pollinating more than 100 agricultural crops in the United States, including our fruits, vegetables, seeds, legumes, and 16 types of flowers species. Loss of our honeybees could have a devastating effect on our food supplies causing grocery stores to have a limited supply of produce and meats. Lack of food would cause grocery stores to close their doors and food prices to skyrocket! 10 years ago France faced this same honeybee problem. When beekeepers inspected their hives, they found once thriving hives with a handful of worker bees, the queen and unattended larvae and no sign of the 30,000 and upward bees anywhere! All the bees had disappeared and the hive was doomed! It's now known as CCD, Colony Collapse Disorder. French Beekeepers rallied, in number, to protest in front of Bayer Pesticide Factory throwing their deserted hives over the plant's security fencing. Beekeepers rallied under the Eifel Tower, burning their hives, in protest, to make their government aware of the growing problem systemic pesticides were causing. The final outcome, systemic pesticides were banned by the French Government and the population of bees began to grow. 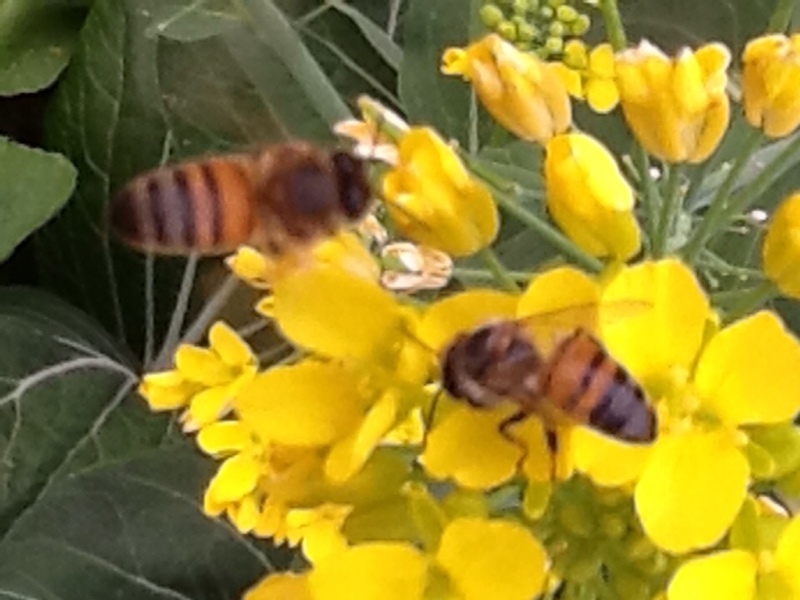 Bees are facinating creatures and play a critical roll in our sustainability on earth. I love hanging out with them watching as they gather pollen and nectar. There are an estimated 100,000 backyard beekeeping hobbiests in the United States and Will and I plan on making that number 100,002! We can make a difference by growing organic gardens and organic bees. When we buy organic, it is sending a clear message to the farmers that we don't want our foods laced with poisons! Buy from your local farmer's market, only buy foods that are in season. Instead of mowing your lawn, put in a garden. Fresh picked produce has superior flavor and nutrition. And if you have the space and inclination . 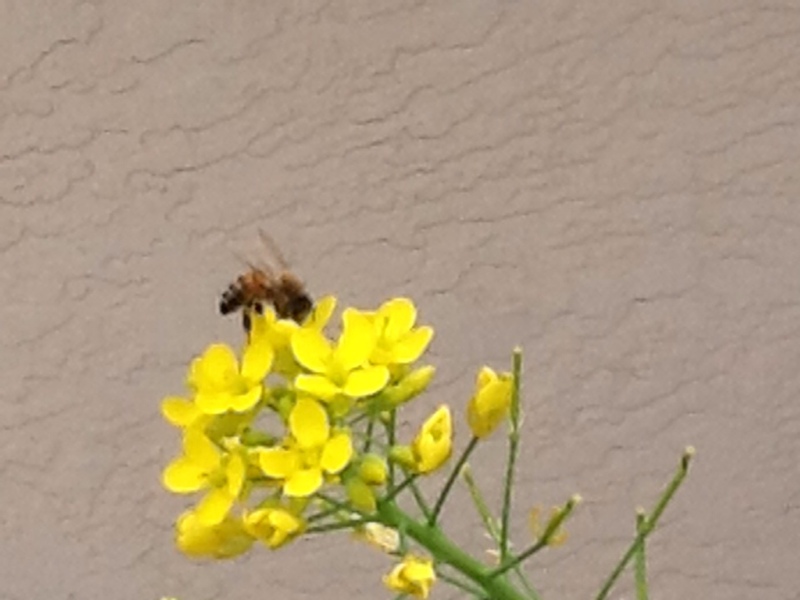 . . become a backyard beekeeper!